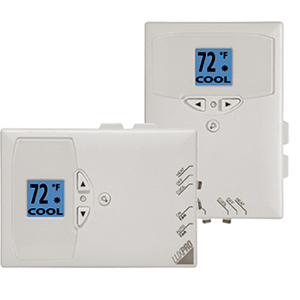 As an alternative to the standard Digital Programmable Thermostat, we offer a simple Non Programmable Thermostat that can be mounted vertically or horizontally. It is ideal for applications where programming features will not be necessary. Simply turn the unit to HEAT or COOL, set the fan in the AUTO (comes on with the unit) or ON (continuous duty), and set your desired temperature – that is it! The thermostat will now maintain that set temperature until you turn it off or change the temperature. Again, this item is ideal for folks looking for a simply controller and a slimmer wall mount design. This can be a FREE alternative to your Programmable Thermosat upon purchase of any Mermaid Air System. It can also be added later to any of our standard 24v control a/c systems (Not FX-1 Thermostat adaptable).